Nowadays it takes around 12 minutes and 50 seconds to produce the average pair of jeans. Well, it took us 11 hours to create our version of the ideal pair of jeans… and that was only the part of them! Here is our story of searching for a perfect behind and painting the perfect jeans on it in order to create a perfect commercial. Some guys probably think this sounds like a dream job, but, believe me, it can be exhausting to hunt for available beautiful butts, especially for several days in a row. Had we been in California, it probably would have been much easier, but we were in Moscow. Adorable, slim Slavic girls usually do not have protuberant Brazilian shapes. Also, in the current Photoshop era, you never know what is fake and what is real. I’ve seen that Youtube video where a girl is photoshopped into a pizza. It’s a piece of cake for professionals to enlarge and smoothen body parts, so we made an offline casting with the best candidates to know for sure we had found the perfect model. It’s important to use professional and non-allergenic paints, which some non-professional body painters neglect to do. As a result, their models often suffer from unpleasant allergic reactions. Dear makeup artists, please take proper care of your models! Our beautiful model can’t sit in the traditional way, as she has the beginnings of a masterpiece on her behind. Kate is sewing tiny stitches onto the jeans. It’s precise and meticulous work. Time for the photo shoot​. Rain was not part of our plan, but we had to deal with it. This project was created in summer 2013 for Getwear company. The slogan for campaign was “Like Second Skin”. 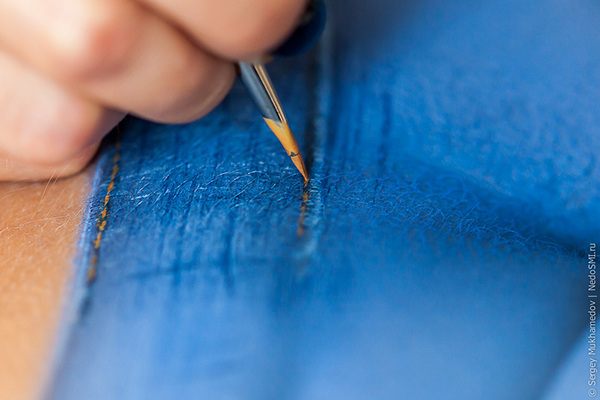 The company creates custom jeans using clients’ specific parameters and designs. They fit almost as a second skin, as we represented with a painted pair of jeans on Kate’s body.